A schematic side view of the spintronics device. The dark grey graphene flake is protected by boron nitride layers (green). Voltages applied to the bottom electrode (bg) and the top electrode (tg) generate the electric field used for spin manipulation. The cobalt electrodes (numbered 1 to 5) are used to generate and detect spin information. By isolating the spin information from the influence of the outside world in a nanoscale graphene device, physicists have found a way to preserve spin information for much longer than previously possible. Researchers from the FOM Foundation and University of Groningen have found a way to preserve spin information for much longer than previously possible. They isolated the spin information from the influence of the outside world in a nanoscale graphene device, in which they can easily manipulate the information with electric fields. This feature makes their device an attractive candidate for future computer data storage and for logic devices based on spins. The researchers published their results online August 22, 2014 in Physical Review Letters. A optical microscope image of the spintronic device (top view). The top electrode (tg) and cobalt electrodes (1 to 5) are yellow. The boron nitride layers (in green) encapsulate the graphene flake, which is outlined by the dotted line. So far, physicists could only change the value of spins in graphene (and therefore the value of the ‘bits’) by using magnetic fields. 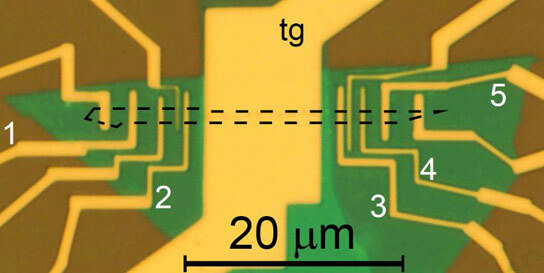 Using two gate electrodes, the researchers now managed to manipulate the spin information in their device with electric fields instead. Since electric fields are much easier to generate in nanoscale devices, these results pave the way to future spintronic devices based on graphene. Be the first to comment on "Physicists Preserve Spin Information for Much Longer than Previously Possible"